In the olden days, lox was made only with the belly of a salmon. It was cured with salt and perhaps a bit of sugar, and that’s it. But as lox has evolved, so too has its flavor, which today might include everything from orange zest and ginger peel to pastrami spices and brown sugar. One of the more eye-catching lox variants to hit New York City in recent years can be found at Black Seed Bagels. Executive chef Dianna Daoheung developed a recipe for a beet-and-horseradish lox that’s become something of a signature for the shop, which has three locations across the city. 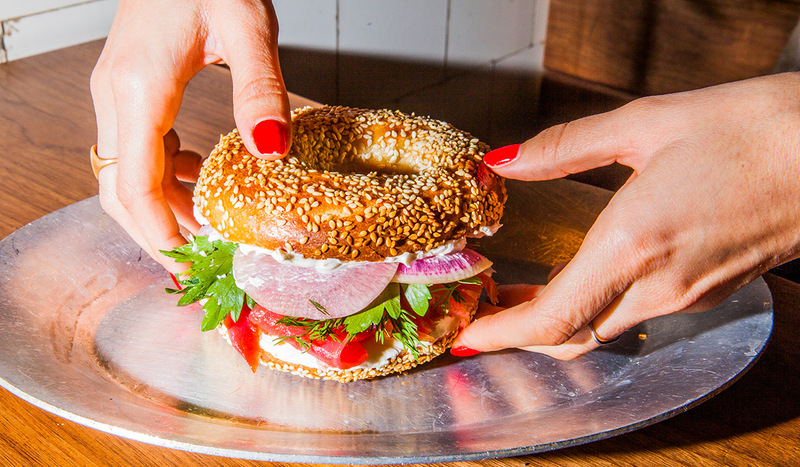 The fish is stained a deep ruby-red, and when thinly sliced, nearly melts into the bakery’s Montreal-style wood-fired bagels. It’s beautiful to behold, eminently Instagrammable, and, most importantly, delicious to eat. It’s also incredibly easy to make at home. Now, before we get too deep into the lox-making process, let’s take a moment to discuss terminology. Lox is sometimes referred to as cured salmon, meaning it’s covered in salt and seasonings to draw out moisture, but not actually cooked or smoked. Lox is rich, silky, and borderline-translucent when thinly sliced; and today it’s made more often from a salmon filet than belly. Lox is not smoked salmon. Smoked salmon is also cured but then, as its name implies, either cold- or hot-smoked for a period of time. Gravlax is lox, Scandinavian-style, cured with less salt and more herbs like dill and juniper, plus alcohol for good measure. Nova is cold-smoked salmon from Nova Scotia. Got that? We could go on all day, but those are the basics, so let’s move along to how to make lox. At Black Seed, they have both the aforementioned beet-and-horseradish lox (or cured salmon), and a double-smoked salmon available. Both varieties are actually made by Acme Smoked Fish in Brooklyn, which has been curing and smoking fish for local restaurants and businesses for nearly a century. “At first, we did everything ourselves, but it got so busy that we decided to hand over the lox to the experts,” says Daoheung, who supplied the fish company with a custom Black Seed recipe for their first-ever foray into beet-curing. “Acme is fourth-generation family-run and they really know what they’re doing,” she says. The company now provides 20 pounds of beet-cured lox and 100 pounds of double-smoked salmon to Black Seed weekly. Developing a specialized lox recipe was a natural part of Daoheung’s evolution at Black Seed, which she has been a part of since even before day one. After leaving a fast-paced but buttoned-up career in advertising, the Florida native enrolled in the French Culinary Institute’s pastry program, “because I knew the least about it.” A chance meeting with Black Seed’s owner, Noah Bermanoff, while he was opening his first restaurant, Mile End, lead to a long and fruitful collaboration. Daoheung joined the kitchen team at Mile End and developed a bread program there before decamping to San Francisco to pursue pastry at Boulevard, a Michelin-starred French-American restaurant. She moved back to New York and was cooking at Isa when her old boss, Bermanoff, told her of his plan to open what would eventually become Black Seed Bagels. Daoheung, working as a sous chef but missing breads and pastry, re-joined forces with Bermanoff, and today oversees both the kitchens and business operations for the growing business. In addition to the lox and smoked salmon, she developed the recipes for the chain’s beloved bagels, along with cream cheese, pastries, and more. But about that lox: “Making beet-cured lox is an extremely easy process,” says Daoheung, even for the curing neophyte. The hardest part of the whole thing is, arguably, waiting three to four days for the cure to complete. The basic cure for a 1 ½ pound piece of fresh salmon is 1 cup of kosher salt mixed with ¼ cup of granulated sugar. “We keep it simple, but you could add peppercorn, mustard seeds, or caraway seeds here if you’d like,” Daoheung says. From there, Daoheung smothers the salmon with a a few cups of grated raw beets and a cup of grated fresh horseradish root. “The beets are really more for color than flavor, but the horseradish gives you that great earthiness,” she says. “You could also add ginger root, lemon zest, or orange zest here if you’re into experimenting.” From there, the salmon is topped with fresh dill fronds, then placed in the refrigerator for three to four days to cure. After the second day, Daoheung will remove the salmon and rinse the cure and beet-horseradish mixture off, then re-coat the filet with a second batch for extra color, though this step isn’t necessary for home cooks. After three days, begin to check the firmness of the salmon, which will indicate its doneness. It should spring back gently when you touch it (too hard and the salmon is overcured; too soft and you probably need to leave it in for another 12 to 24 hours). Toss any leftover cure or veggies and give the salmon a final rinse before serving.Slice it very thing from a high angle to show off your handiwork and the salmon’s beautiful jewel-toned hues. Lay out a piece of plastic wrap approximately three times longer than the salmon. Place the salmon, skin side down, on top of the plastic. In a small mixing bowl, combine the salt and sugar. Using your hands, rub the salt mixture across all sides of the salmon, evenly coating every part of its surface with a thick layer of salt. In a small mixing bowl, combine the grated beet and grated horseradish. Generously coat all sides of the salmon with an even layer of beet mixture. Scatter a handful of fresh dill fronds across the top of the salmon. Cover salmon loosely with plastic wrap and place in the refrigerator. After three days, check for doneness, and cure for an additional day if necessary. When salmon is fully cured, rinse excess cure and pat dry. Slice very thinly, from a high angle with a very sharp knife, and serve with bagels, cream cheese, and sliced vegetables.